My love for polenta started at Aqui’s Mexican Restaurant – I really love their entrees that are served with polenta, but it always seemed to be something that I would never consider making at home. Then I discovered Food Merchants ready made polenta at Whole Foods – I could cut the log into slices and grill them, or break down the polenta with some milk or water to turn it into a creamy polenta. This isn’t the cheapest way to make polenta, but a good ingredient to have the in the pantry to throw together a quick dinner (and doesn’t require dirtying up lots of dishes!). Bring the water to a boil and add the salt. With a wire whisk in one hand, slowly stream the cornmeal into the water and whisk constantly. Allow the mix to rise up in the pot at least once and then transfer the contents into a double boiler. Simmer it on low for about 8 to 10 minutes until fully cooked (some folks say it is done when it starts to come away from the side of the pot). I love this recipe because it is so versatile. 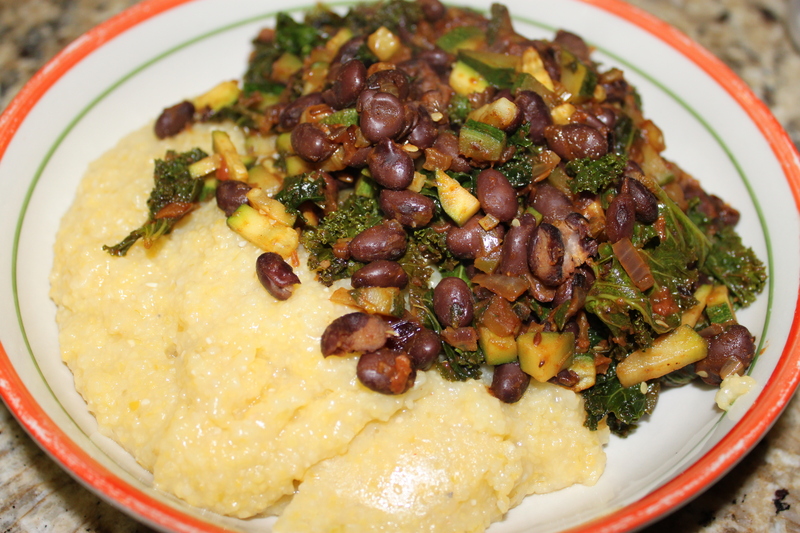 You can add so many other ingredients while adding the polenta to the cooking water – here are some of my ideas, but I’d love to hear your ideas in the comments section!